Today's lesson is about Noah and the ark God told him to build. 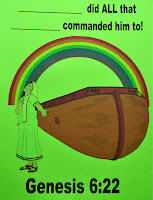 Noah did it, EXACTLY as God told him to... and it saved him! 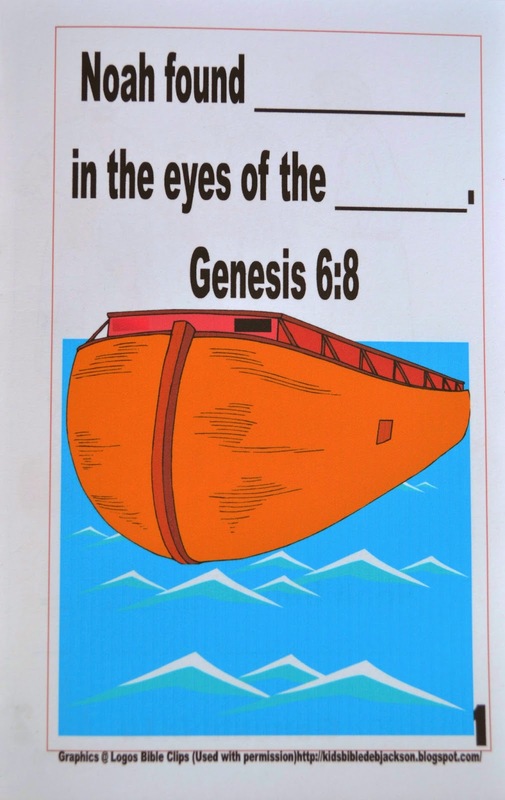 Today's project is a booklet that the kids will fill in the blanks as we talk about the Bible lesson. My kids have learned about Noah a lot already, so the fill-in-blanks should help them remember the little details from Genesis. I have included the scripture in case you want to have kids use their Bibles and find the answers themselves. But, I like having a Bible lesson straight from the Bible anyway. There's not a better place to get the answers! Lesson found in Genesis 6-9: After a long time, God saw that the people on the earth were evil all the time, God was sorry that He created man. God said that He was going to destroy man and the animals because He was sorry that He made them. 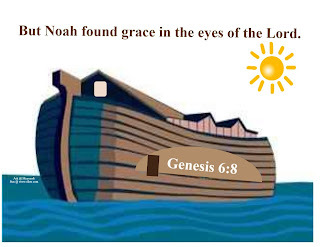 Today's Bible verse says: But Noah found grace in the eyes of the Lord. Noah obeyed God. He had 3 sons named Shem, Ham and Japheth. God told Noah that the people on the earth were so bad and that He is going to destroy them. “Make yourself an ark of gopher wood.” God told Noah exactly how to build it and exactly how big to build it, exactly what to use, exactly how many floors, windows and doors. [Show diagram to further discuss. It was 300 cubits long, 50 cubits wide and 30 cubits high, 3 floors, 1 door on the side & 1 window.] Noah didn't pick and choose what he wanted, or what he felt like doing. He did all that God said to do. God said “I am going to bring a flood and destroy everything, except for you, your wife, your sons and their wives. I want you to bring a male and female of every animal and keep them alive on the ark. God told Noah to go onto the ark. He was to take 7 each male/female of the clean animals, 2 each male/female of the unclean. 7 each of the bird’s male/female. Noah was 600 years old when God flooded the earth. It took 7 days for the animals to go onto the ark. (vs. 4) They went 2 by 2, male & female. (vs. 9) God shut the door of the ark. It rained for 40 days and 40 nights and covered everything. Everything that was not in the ark died. The water picked up the ark and it floated. God made a wind pass over the earth to help dry it faster, the waters settled in the earth and it stopped raining. There was water on the earth for 150 days. The ark came to a stop on Mount Ararat. After 40 days, Noah sent out a (1) raven. Then he sent out a (2) dove, but it came back since there wasn’t any place dry for it to rest. After another 7 days passed, he sent out another (3) dove and it brought back an olive leaf. After another 7 days, he sent out the (4) dove and it didn’t return. That meant there was someplace it could make a home. 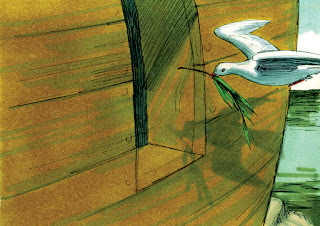 Noah took off the covering from the ark and looked to find the ground was dry. If you add up all the days, they were on the ark for 1 year! God told Noah to leave the ark with his family and all the animals. Noah built an altar and offered sacrifices to God. 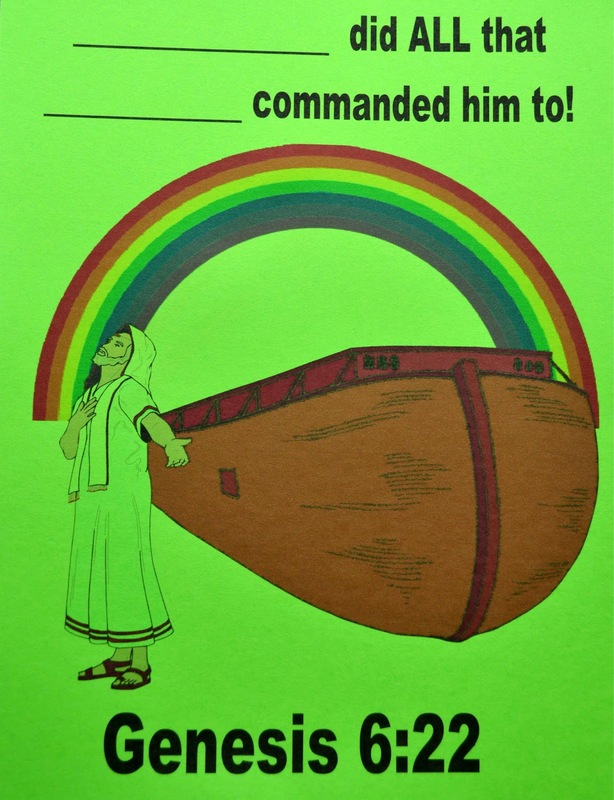 God was pleased with Noah and put a rainbow in the sky. He said it is His promise to man that He would never destroy the earth with water again. Every time you see the rainbow in the cloud, it will remind Him and the people of His promise. Noah lived 350 more years after the flood. He was 950 years old when he died! This is the table visual my husband made for me several years ago. There is a train car on the top so the kids can understand the scale. Here is today's Bible verse. There are 6 on each sheet (for a class). You can print it here. Here is a full page size Bible verse to print. You can find all the Genesis Bible verses here. 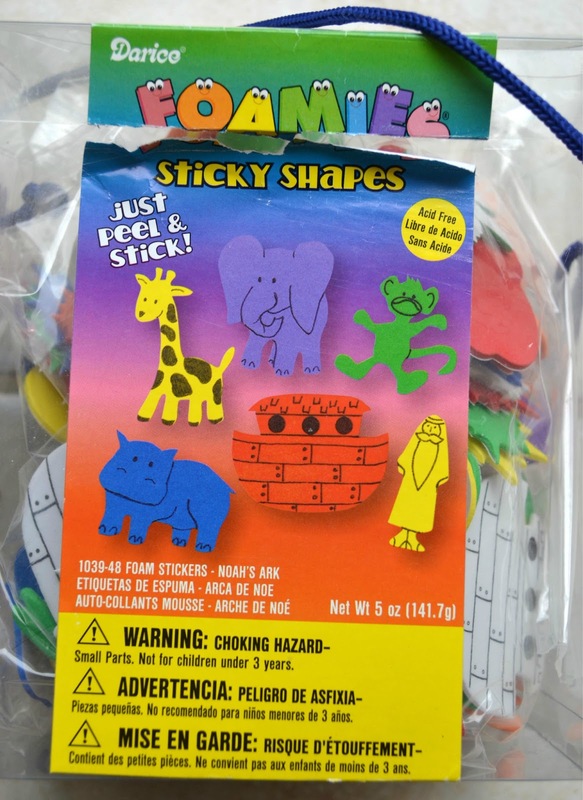 There are a lot of foamie sets and sticker sets for Noah that you could use for this page. Or, if you have a diecuts for Noah, that would be great also! I am using this sticker set for the workbook (instead of printing page 2). See all the Genesis cut and paste worksheets and lapbook printables here. This is great. I just reread the story of Noah the other day and still astound me the size of the Ark. Creation Magazine had a great story. Oh, how fun! Thanks for sharing! Have a great weekend. I'm your latest follower. So nice to meet you. Hailing in from Friendship Friday! Thanks for stopping by and being a follower! I appreciate it. I follow you on Google+. This is really cool! Thank you so much for sharing this! I found your site through Mission Women, and I'm so glad I did! What a great resource you have given us!! Thanks so much for visiting! I appreciate the nice comment! I love your englisch bible lessons. Compliments. Thanks so much! I appreciate you stopping by and leaving the nice comment! Wow, very cool! 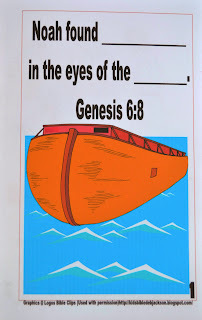 My pastor recently did a sermon on Noah, as we are going through the book of Genesis, and I was shocked to learn that the ark didn't look the way we were shown in Sunday School-you know, a boat-looking thing. I love your table visual. Thanks for stopping by! I appreciate it and can't wait to tell my husband someone loved his Ark visual! Can you see the train car on top? Makes it more realistic for the kids! Great lesson! thanks for linking up to TGIF! I always look forward to your lessons! Thanks for the nice comment! I appreciate you having the TGIF link up party! Thanks! Use this example to have the kids put out all their animals and sing the song. The lapbook for Genesis links all go to the lapbook for the life of Jesus. Suggestions? Sorry, I am not seeing any Jesus links here. 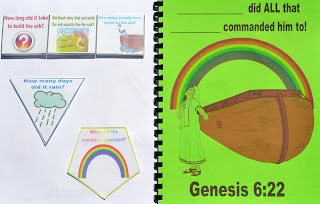 The above link is going to the correct Geneses post @ http://www.biblefunforkids.com/2013/05/genesis-lapbook-cut-glue-student.html and they are Genesis printables. 1 Year Blog Anniversary with the Top 10 List!